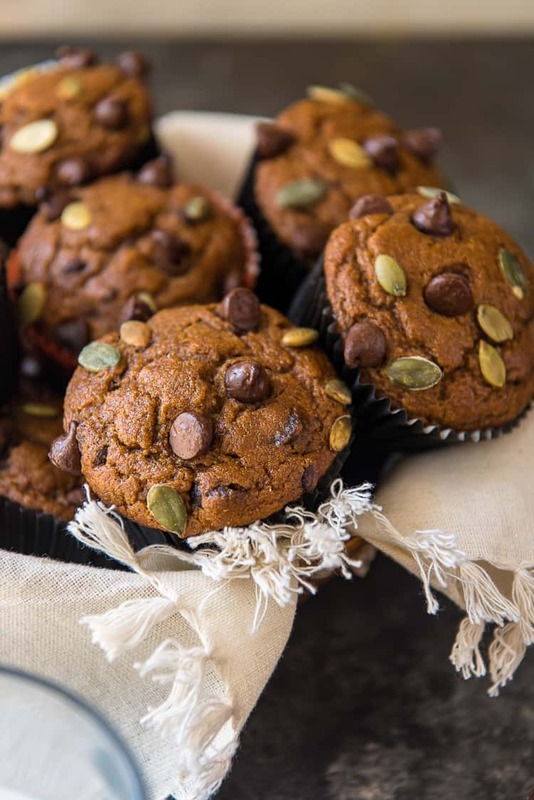 Fluffy and packed with flavor, these Pumpkin Chocolate Chip Muffins are about to become your new favorite fall treat! 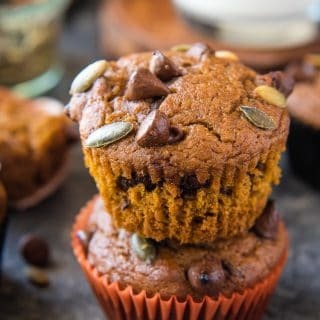 These super moist buttermilk pumpkin muffins are chock full of chocolate and crowned with toasted pumpkin seeds for a lovely crunch. This post is sponsored in conjunction with PumpkinWeek. We received product samples from sponsor companies to aid in the creation of the PumpkinWeek recipes. We only work with companies that we love and, as always, all opinions are 100% ours. Tell me you’ve enjoyed Pumpkin Week as much as I have! It’s crazy how quickly it flew by – I haven’t had a solid week of recipes in a few months, and seeing the happy reception of these new treats has made my heart positively glow. Whether you’re pumpkin lover or just a tolerator (obvs if you’re a hater, you’re not reading this), I hope you found a new recipe to get excited over this fall! JUST TAKE ME TO THE PUMPKIN CHOCOLATE CHIP MUFFINS ALREADY! 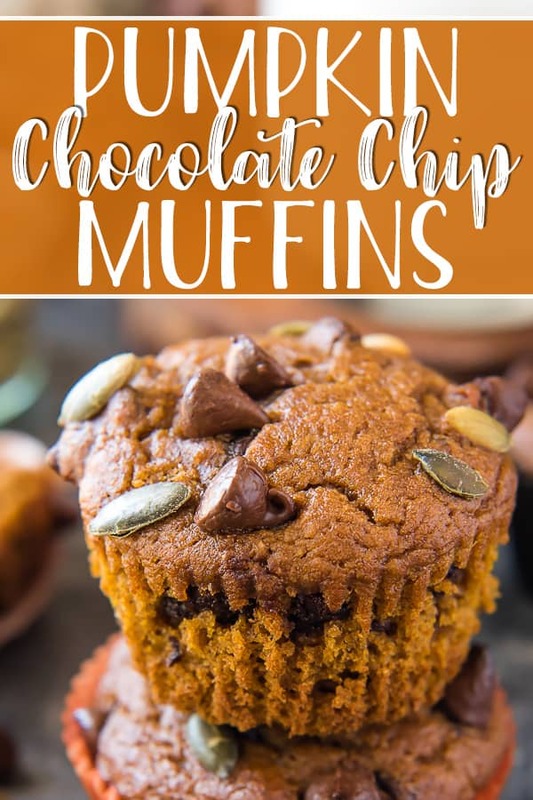 If you’d rather skip my (pretty darn helpful) tips and tricks, essential cooking info, and similar recipe ideas – and get straight to this deliciously easy pumpkin muffins recipe, just scroll right on down to the bottom of the page where you can find the printable recipe card! Speaking of fall, it sure doesn’t feel like it’s only a couple of days away. Honestly, how is anyone supposed to be ready for a season that still feels like it’s months away? 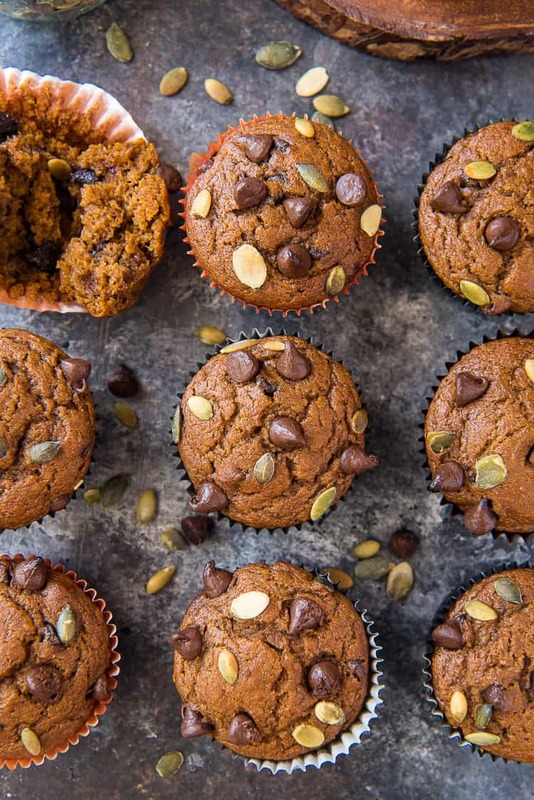 Having treats like these pumpkin chocolate chip muffins in the house helps, for sure. And yet…I can’t help but look forward to the morning I can enjoy one with a cup of hot coffee on my back porch without breaking a sweat again. It depends on which muffins we’re talking about! For the most part, muffins are considered unhealthy as they’re high in fat, calories, and carbs. There are, however, plenty of varieties and substitutions that can bring them into the realm of a once-in-a-while treat to enjoy with little guilt! 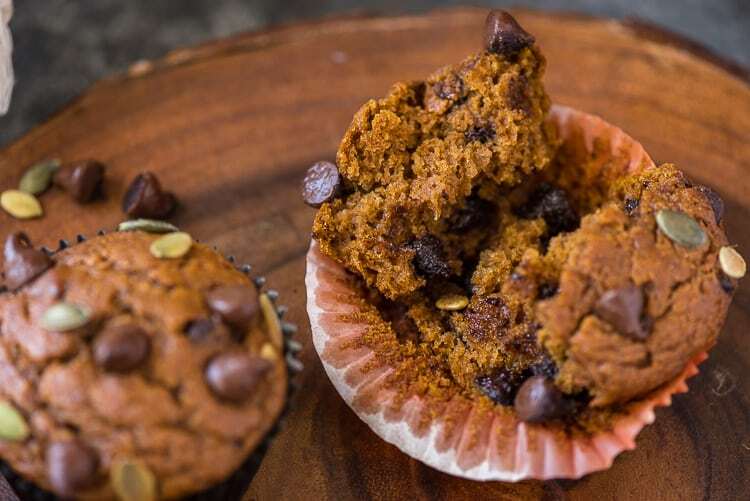 These Pumpkin Chocolate Chip Muffins are made with avocado oil and half of the flour has been subbed for wheat flour. One muffin will cost you less than 250 calories and only 9 grams of fat. Not too shabby, considering the chocolate chips loaded into these babies! Yes! 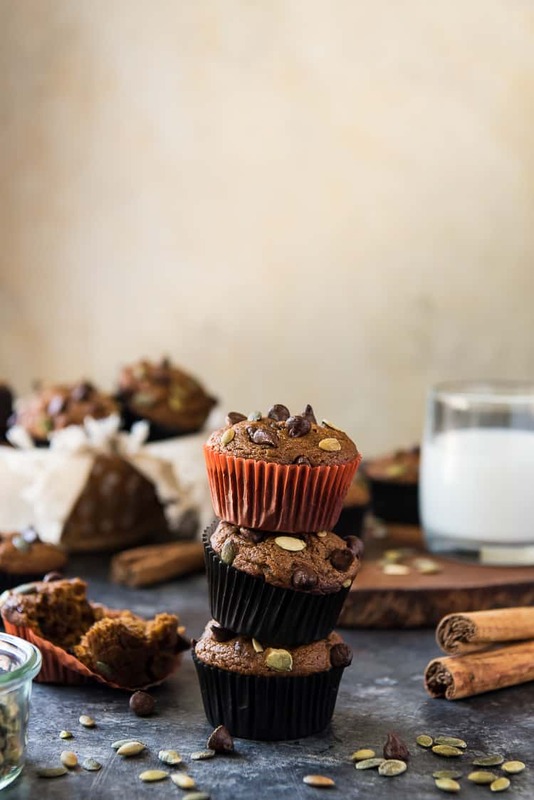 To freeze any extra or leftover muffins, cool them completely, then wrap them tightly with plastic wrap or aluminum foil and place them in a freezer bag. Store them for up to 3 months. To reheat frozen muffins on the fly, remove the plastic wrap, rewrap in foil, and warm in a 350 degrees F oven for 5-10 minutes, until they’re heated through. In the microwave, nuke them in 20-second intervals on 50% power until heated through. What are my three secrets to the fluffiest muffins with the tallest domes? Proper Temperature of both ingredients and the oven. All refrigerated ingredients (buttermilk, eggs, butter, pumpkin puree) should be at room temperature when making muffin batter. As for the oven, bake muffins at 400 degrees F. The initial blast of high heat causes the leavener to rise quickly and the muffin to bake perfectly. Proper Mixing. Meaning no over-mixing! Just like all cupcake and layer cake recipes, muffins need to be mixed until just combined. If you still see a couple streaks of flour in the batter before you fill your muffin pans, don’t worry! It all comes together in the end, and you’ll end up with a tender muffin that is in no way chewy or overly dense. BONUS! Weighing Dry Ingredients. Ever since my obsession with The Great British Baking Show began, I’ve turned to weighing out my flours vs. scooping them with American cups. I promise, you will never fail a recipe due to too much flour by going this route! First, you’ve gotta set your oven temperature to 400 degrees F. Line a couple cupcake pans with liners and get to mixing that batter. Combine the dry ingredients in one bowl and whisk it all together. In another bowl, mix your oil, sugar, and eggs (1 at a time!) until they’re well combined. Next, add some pumpkin puree and vanilla. Here’s where the flavor comes in! Then, add the flour and buttermilk in 3 separate additions: flour-milk-flour. Mix it only until it’s just combined, so you avoid chewy muffins. Fill your cupcake pans up 3/4+ full. The more batter per liner, the fewer muffins you get – but you’ll end up with lovely domes! Now bake those pretties for 18-20 minutes until they’re browned and ready to devour. Happy Pumpkin Week! Have you entered our amazing giveaway yet? Hop on over to this post and scroll down for the details! Preheat oven to 400 degrees F. Line 2 muffins tins with 18 muffin liners (or spray with cooking spray). Set aside. In a large bowl, combine the flours, cinnamon, baking powder, baking soda, salt, and pumpkin spice. Whisk until well blended. In a separate bowl, whisk together the brown sugar and oil until well blended. Whisk in eggs, 1 at a time, until blended. Add the pumpkin puree and vanilla and mix well. Add half of the dry ingredients and mix well. Add the buttermilk and mix, then add the remaining dry ingredients. Mix until just combined. Fill each muffin liner 3/4 of the way full with batter. 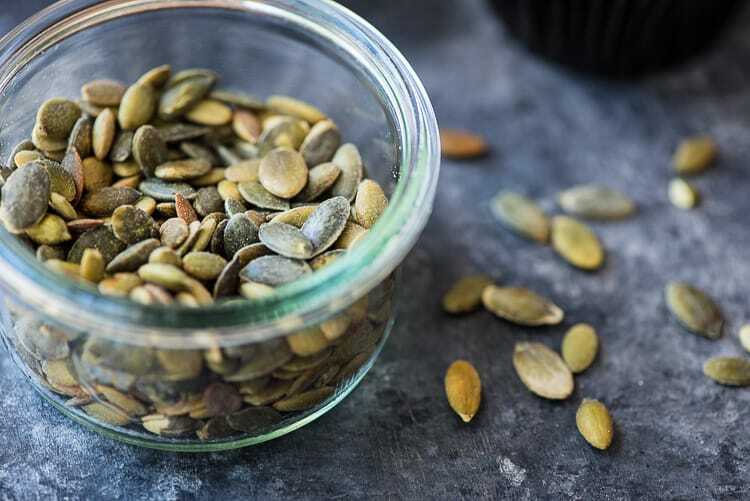 Sprinkle additional chocolate chips and pumpkin seeds on top. Bake for 18-20 minutes, until a toothpick inserted in the center of muffins comes out clean. 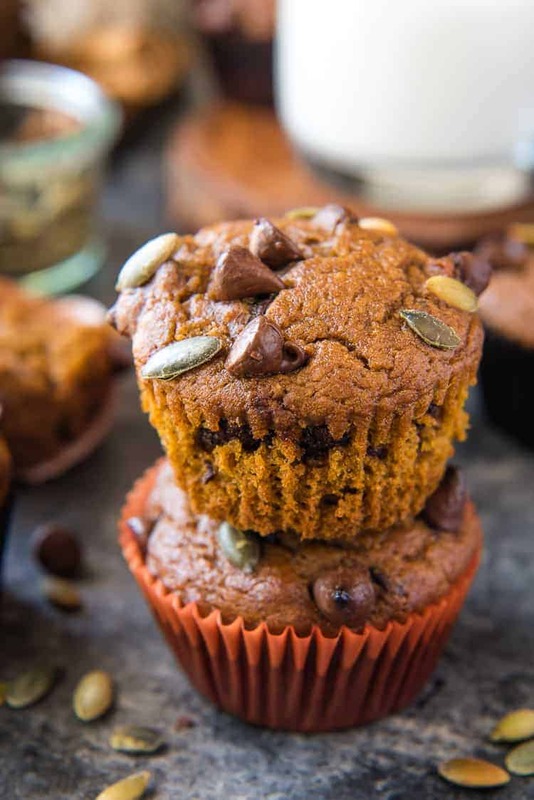 PIN THIS PUMPKIN MUFFIN RECIPE FOR LATER! 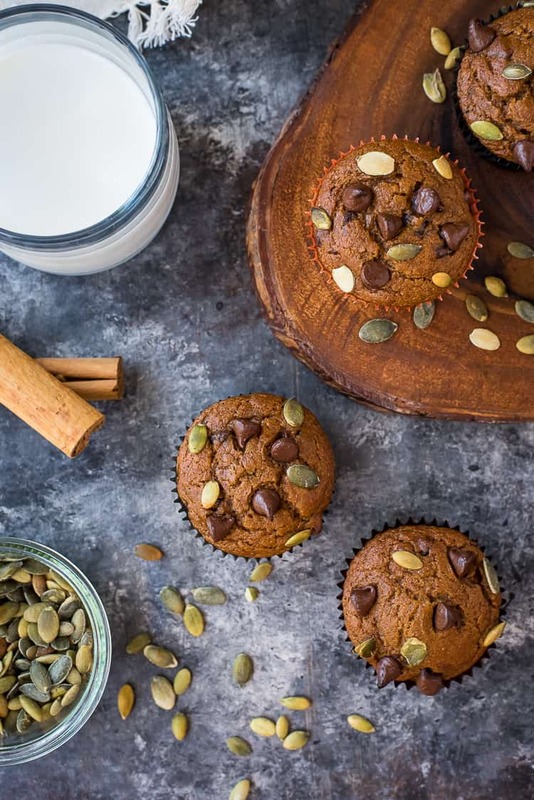 Love the addition of pepitas to these muffins.